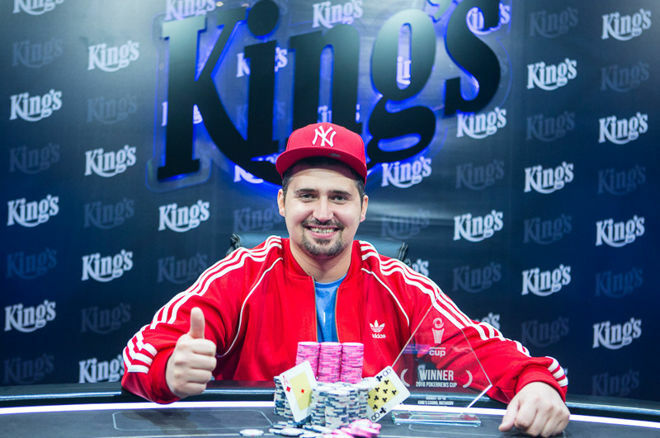 The final day of the €250 PokerNews Cup Main Event at the King's Casino in Rozvadov saw eight players out of a 1,104 entry strong field return to the feature table at Europe's biggest card room. Out of the €235,980 total prize pool, €138,202 was still up for grabs to start the day and Timur Caglan claimed the biggest portion by walking away as the PokerNews Cup champion. Ronny Voth was leading the field of survivors and the German ultimately got heads up for the championship after eliminating four opponents. After a hard-fought duel of more than two and a half hours, Caglan defeated Voth to emerge victorious for a payday of €44,707. The final table started with a bang when Miroslav Lelek shoved out of the small blind in the second hand of the final table. He was called by his neighbor Ondrej Vlasanek. Lelek's ace-five suited failed to hold up against the king-queen of Vlasanek forcing Lelek to make his exit. Soon after, Christian Sperrer followed in seventh place when his dominated ace-three didn't get there against the ace-nine suited of Ronny Voth. An hour later, Alin-Florin Toma was eliminated in sixth place. He flopped top two pair with king-queen and Voth called with the nut flush draw. The flush hit on the turn and put Toma out after he failed to boat-up on the river. Ten minutes later, the field was reduced to the last four. King's Casino regular, "Magic Man 558" (King's has a policy that allows players to keep their real names anonymous) started the day third in chips, but quickly lost half of his stack. "Magic Man" then got his chips in the middle with pocket jacks and was called by Vlasanek who held pocket nines. Vlasanek's nines delivered him a gutshot straight draw on the flop, and he turned the straight with the next card sending "Magic Man" home in fifth place. Rikk Effendi had the least amount of chips when the final table started but found an early double-up. The German laddered up all the way to fourth place but eventually got it all in with a four-bet, holding ace-queen. Three-bettor Voth looked him up with jack-seven suited and flopped a seven. Another seven on the river gave Voth trips putting an end to Effendi's run. Another fifteen minutes later, the heads-up match was set. Ondrej Vlasanek lost a few early pots and then three-bet all in with ace-five. Voth snap-called with ace-queen suited and the Czech was drawing dead on the turn to finish in third place for €19,539. While many would have expected an easy ride for Ronny Voth, who held a commanding 3-1 lead at the start of the heads-up, that lead soon disappeared. Caglan slowly added to his stack little by little, eventually getting himself even with Voth. Then, after a series of bigger hands, including an expensive missed bluff, Voth found himself on the short stack. Voth then shoved king-five suited and Caglan called with ace-eight. Caglan flopped two pair and Voth was drawing dead on the turn. It was by far the biggest payday so far for Caglan, who previously had an 18th place finish at the German Poker Tour here in Rozvadov for €2,007. Now, he took home a stunning €44,707 and the PokerNews Cup on top of eternal bragging rights. 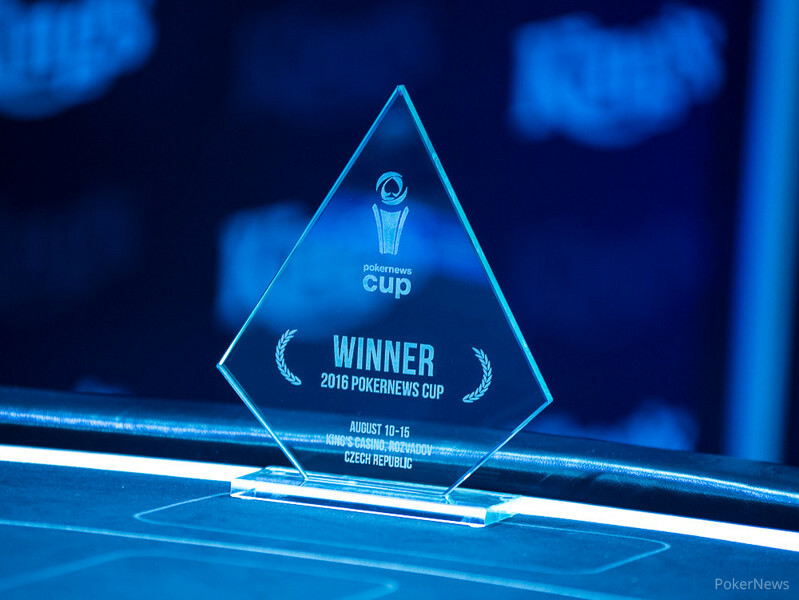 That marked the end of the PokerNews live coverage from Rozvadov, but the next edition of the popular PokerNews Cup is already around the corner. The Cup will make it's North American debut at Borgata Hotel Casino & Spa. The two-day featured event will begin on Tuesday, Sept. 20, 2016, as part of the 14th annual Borgata Poker Open tournament series. The PokerNews live reporting team is now heading to Barcelona at the end of the week for the first stop of the European Poker Tour in Season 13. The 2016 EPT Barcelona is Coming. Do You Know Who Cashed in the Main Event More Than Anyone?